A new trend is emerging in Sydney Harbour — residential zones are popping up, and Sydneysiders are flocking to new waterfront developments. The Harbour has traditionally been home to commercial buildings, but in the last six years it has experienced a major facelift. Two of Sydney’s largest waterfront precincts, Barangaroo and White Bay, have finally opened its doors to the public after over 50 years, resulting in new residential and commercial developments. This puts Sydney’s CBD on the list of the top five fastest growing suburbs in NSW. Futurist, demographer and social commentator Mark McCrindle said residential zones have largely been lacking around the Harbour area. "However, new developments such as Darling Harbour, Wentworth Park, and the Bays Precinct are bringing high-density apartment buildings to Sydney’s CBD, increasing the population," he said. Nearmap, an Australian-grown, international provider of high resolution aerial imagery captured how Sydney Harbour has transformed into a skyscraper landscape, by taking progress shots of select Sydney areas over varying amounts of time, depending on the level of their development activity. 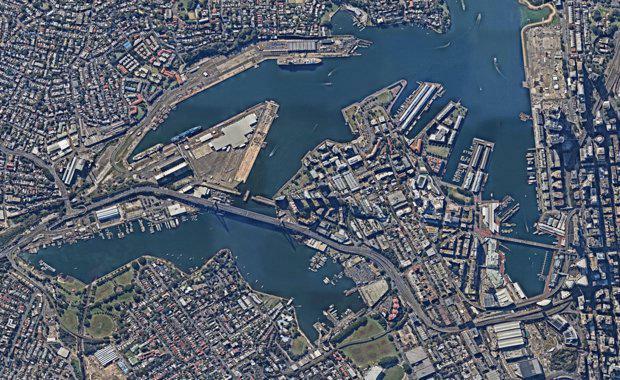 “In areas with a large population, like Sydney’s CBD, aerial imagery is used to analyse the impact that a new construction may have on a community,” Nearmap General Manager John Biviano said. “While surveying Sydney, we’ve seen the great transformation that the harbour has experienced over the last few years and we’ve identified an emerging trend where high-rise residential buildings and recreational areas are being developed along with office towers. 'Unlike previous years, Sydney Harbour is unlocking its seafront locations, not only to commercial developments but also to the general public," he said.